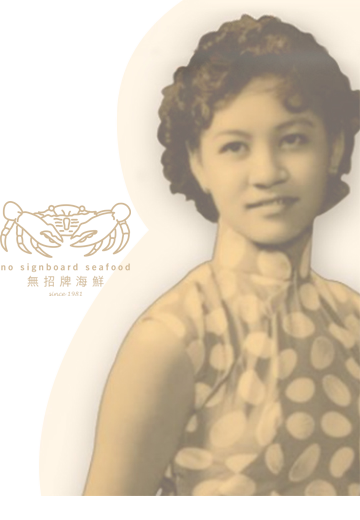 Our origins can be traced to the late 1970's, when our founder, Mdm Ong Kim Hoi, the grandmother of our Executive Directors, Sam Lim and Lim Lay Hoon, started a seafood hawker stall at the Mattar Road Hawker Centre. Back in those days, it was uncommon for hawker stalls to sell fresh seafood and much less, crab dishes. However, our founder, who had the penchant for cooking, specially created our now acclaimed White Pepper Crab dish to differentiate our hawker stall from the competition. Till today, this homemade recipe remains a well-guarded secret, known to select members of the family. Through word of mouth for our unique and tantalising White Pepper Crab dish, and since our first hawker stall did not have a signboard, we became known as the No Signboard Seafood hawker stall, forming an integral part of our identity. We left our Mattar Road hawker stall in 1990 and opened our first ‘No Signboard Seafood’ stall in a hawker centre at Farrer Park. It was a success and we continued to build up our brand over the years. In 1998, our Executive Chairman and Chief Executive Officer, Sam Lim, joined the family business as general manager. Under his leadership, our Group steadily transformed from its inception as a hawker stall to become a leading chain of seafood restaurants in Singapore.